Tony Thurmond, left, makes a point during the debate at USC Rossier School of Education in Los Angeles. With him are candidates Lily Ploski and Marshall Tuck and moderator Adolfo Guzman-Lopez. The story was updated on March 20 to clarify Tony Thurmond's position on how police officers should be used on campus. Marshall Tuck, Assemblyman Tony Thurmond, D-Richmond and Lily Ploski emphasized the need for substantially more money for K-12 schools and early education. Two of them suggested unorthodox ways to raise at least a portion of what they said is needed. Tuck said that all tax revenue from the legalized sale of marijuana should be funneled to education. He is a former co-founder of the Green Dot charter schools in Los Angeles and was chief executive of the Partnership for Los Angeles Schools, which runs public schools as a collaborative effort with the mayor’s office and the district. Thurmond is authoring a bill that would tax privately owned prisons in California, raising potentially hundreds of millions of dollars that would be used to fund preschool and after-school programs. A former social worker, he is now in his second term in the Assembly and has served on the West Contra Costa Unified school board and the Richmond City Council. They and the third candidate, Ploski, said they support amending Proposition 13 to raise more revenue from commercial and industrial property owners. An initiative to do that, called a “split-roll tax,” raising an estimated $4 billion for K-12 schools and community colleges, will likely be on the November ballot. Ploski is a financial awareness instructor for Upward Bound, a program for low-income and first-generation college students, at Mills College and a former dean and athletic director in the School of Human Development and Performance at Solano Community College. All three candidates will be on the June ballot as they seek to replace Tom Torlakson, the current state superintendent, who is termed out after serving two four-year terms. The candidate who gets more than 50 percent of the vote in June for the nonpartisan office will be automatically elected. If none does, the two leading vote-getters will face each other in a runoff in November. 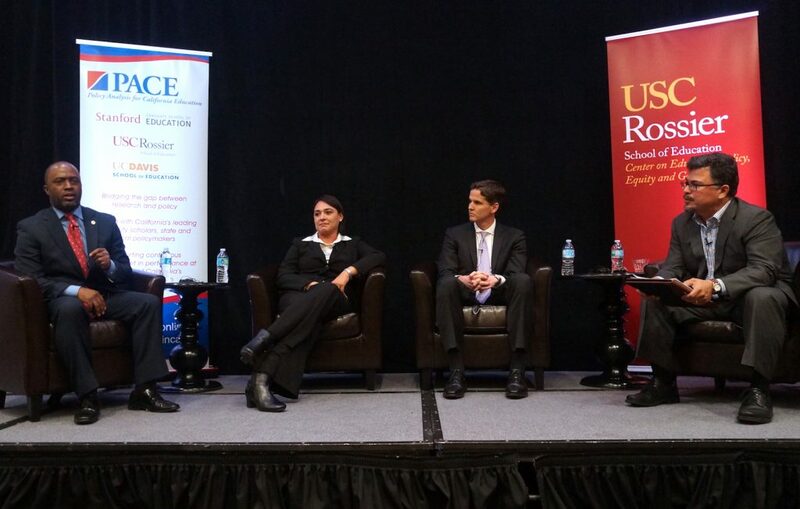 The forum was sponsored by Policy Analysis for California Education (PACE), a research and policy collaboration jointly run by USC, UC Davis and Stanford University, and the Center for Education Policy, Equity and Governance, a new institute at the USC Rossier School of Education. The forum was moderated by Adolfo Guzman-Lopez, an education reporter at KPCC radio. Superintendent of Public Instruction Candidates Forum March 19, 2018. Listen to candidates Lily Ploski, Tony Thurmond, Marshall Tuck, beginning with Marshall Tuck. Moderator is Adolfo Guzman-Lopez of KPCC. 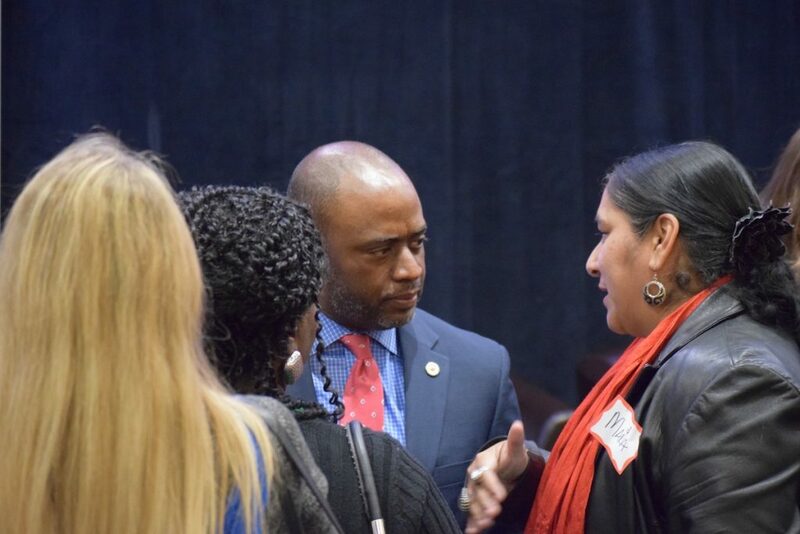 State superintendent candidate Tony Thurmond meets the audience after the forum at the USC Rossier School of Education. Both Thurmond and Ploski agreed that the time it takes a teacher to get permanent status or tenure should be extended to three years, although Thurmond says they should have a right to appeal after the third year, a right teachers don’t currently have. Tuck said that tenure should only be granted after four years, with a possible fifth year for those teachers still not up to speed, along the lines of what Assemblywoman Shirley Weber, D-San Diego is proposing. As for the Local Control Funding Formula, Thurmond said it only guarantees that funding levels should be restored to the pre-recession level of 2008, which is not sufficient. The state needs a permanent source of funding with a goal of reaching the top funded states like New York, he said. The state schools superintendent has limited policy authority beyond serving as a megaphone for education issues. His or her main responsibility is to run the California Department of Education. Yet four years ago, the $30 million raised in the race between Tuck and Torlakson was the most expensive — by far — on the ballot, with unions backing Torlakson and wealthy charter supporters backing Tuck. But at Monday’s forum, both Tuck and Thurmond, who has been endorsed by California’s teachers unions, stressed their independence. Tuck, like Thurmond, said he would support eliminating for-profit charter schools and would have “zero tolerance for fraud” by any school, charter or district. His 6-year-old son, he said, attends a Los Angeles Unified elementary school. 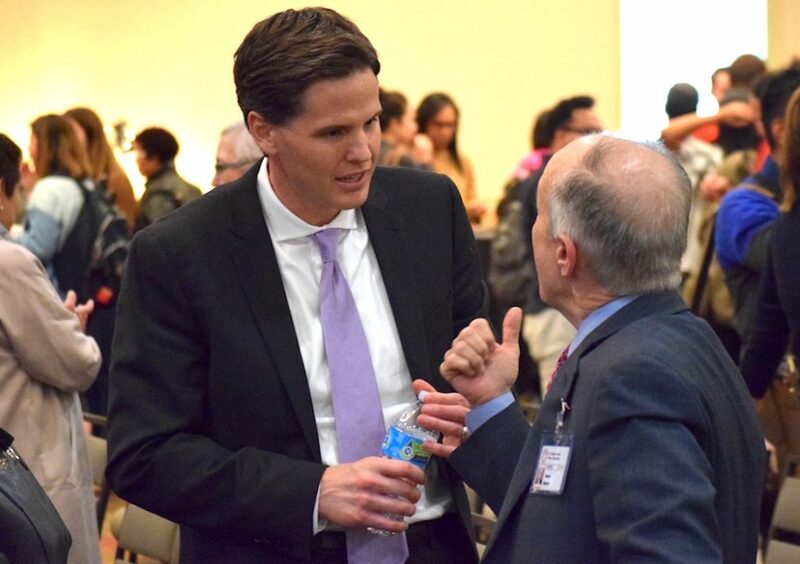 State superintendent candidate Marshall Tuck speaks with an attendee after the forum at USC Rossier School of Education. President Donald Trump’s name came up only once during the forum. “Stand up to President Trump, stand up to Secretary DeVos,” Thurmond said. DeVos, he said, “is saying she won’t fight for all students, including transgender students,” an apparent reference to the Trump administration’s rescinding of rules for gender neutral bathrooms. The candidates embraced successful efforts to reduce suspensions and expulsions in California, but said that fewer students being pushed out of school alone isn’t the answer. Tuck said more training for teachers must accompany fewer out-of-school suspensions. Ploski said more research is needed to understand what happens to suspended students. And she said she “loves restorative justice” — a program in which students acknowledge what they have done and try to make amends to students or others they have wronged. Thurmond, who sponsored legislation to fund restorative justice programs in 30 districts, cautioned against misusing police officers, including school resource officers, on school campuses. Schools should stop “criminalizing kids by asking police officers to be the disciplinarians,” he said. Clarification: An earlier version incorrectly stated that Thurmond opposes deploying school resource officers on campus. Thurmond is the best candidate by a long shot. I think the bill Thurmond mentioned was to establish later school starting times for high school, rather than earlier (as currently represented above). Good catch, David, and I have corrected the piece. Thanks. “Ploski said more research is needed to understand what happens to suspended students. And she said she “loves restorative justice” — a program in which students acknowledge what they have done and try to make amends to students or others they have wronged.” It is apparent that Ploski does not do much research or listen to those who talk about what happens to students who are suspended like Dr.J.Luke Wood, Skiba and Losen. They have outlined clearly what happens to students who are suspended, it is called the school to prison pipeline. Ploski does not have a real clue what restorative justice means. It is not just making amends to those you have wronged, it is also understanding why you did what you did and how to ensure that it does not happen again.